Cirque du Soleil’s newest touring show Amaluna has the potential to be one of its best, but as it appeared at its opening in Toronto there are too many aspects that need to be reconsidered before it can achieve its potential. 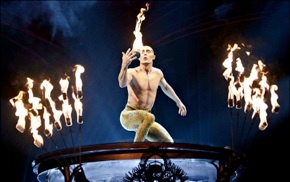 Like Koozå in 2007, Kà in 2005 and Quidam in 1996, Amaluna returns to the origins of Cirque du Soleil by placing greater emphasis on a narrative to provide a context for its sequence of circus acts. This the show claims to be “freely inspired by the world of Shakespeare’s Tempest”, with “freely” as the operative word. Diane Paulus has written a feminist take on The Tempest and added aspects of the plots of Mozart’s The Magic Flute and even the original scenario of Tchaikovsky’s Swan Lake to create her narrative. The two main difficulties are that Paulus as a writer does not make the narrative clear enough and as a director has not paced the action well enough so that it frequently stops dead and has to be revived to continue. The third difficulty is that very few of the acts are truly outstanding. In Paulus’s story Prospera (Julie McInnes) is a human shaman with magical powers who rules over an enchanted island inhabited both by beasts, Amazons and a variety of goddesses drawn from various cultural traditions – the Peacock Goddess (Amy McClendon), the Balance Goddess (Lara Jacobs Rigolo) and the Valkyries (Virginie Canovas, René Koehler, Kylee Maupoux, Andréanne Nadeau). The most important of all is the Moon Goddess (Marie-Michelle Faber) who gives the show its name – “ama” mother plus “luna” moon”. Prospera’s daughter Miranda (Iulia Mykhailova) is on the brink of womanhood and Prospera wants to ensure her a safe and meaningful passage from girlhood to maturity. To that end she causes a massive storm that shipwrecks a crew of men on the island including Romeo (Édouard Doye), not “Ferdinand” as in Shakespeare, whom Prospera intends as Miranda’s spouse if he proves himself worthy. Shipwrecked along with Romeo is his manservant Jeeves (played by a woman, Nathalie Claude), who is costumed like a Molièrean pedant, speaks only French and has nothing to do with the famous Wodehouse character in wit or decorum. Just as Romeo and Miranda fall in love at first sight, so does Jeeves with Miranda’s comic nurse Deeda (Pepa Plana). From the point of view of The Tempest, Jeeves and Deeda serve the function of comic servants Stephano and Trinculo. From the point of view of The Magic Flute, the two serve the function of Papageno and Papagena, as a lower-class couple with an earthy love that contrasts with the idealized romantic love of the main couple. This Jeeves, however, has none of the charm of Papageno. Clearly unhappy with the arrival of Romeo is Cali (Viktor Kee), obviously the Caliban equivalent – half-man, half-lizard – who lusts after Miranda for himself. Through Act 1 the narrative is fine. In Act 2 the problems begin. Prospera prepares to preside over the wedding of Miranda and Romeo, when suddenly the Peacock Goddess reappears. In Act 1 she was dressed in white and Romeo watched her perform an odd, overlong dance without any acrobatic components, that was meant (according to press materials) to represent the purity of love. Now like Swan Lake’s Odile to her former Odette, she is dressed in black, stops the wedding and with her band of black-clad followers deliberately separates the couple and kidnaps Miranda. The meaning of the transformation from good to evil and her alliance with Cali is not prepared for either in Paulus’s story or her direction. As the story plays out the Peacock Goddess’s actions seem to happen in opposition to Prospera’s will, in which case this threat, like that of Cali, should have been made apparent early on and not hit us totally out of the blue. According to the official description, the evil Peacock Goddess has created “a portal to the Underworld through which Romeo must pass”. If that is true, why has she flown up to the ceiling with Miranda and why does Romeo try to reach them by climbing up a pole? When he discovers Miranda she is “trapped” inside a triangle created by the wire of four tightwire dancers (Veera Kaijanen, Julien Posada, Madeleine Prévost-Lemire and Ernest Terri). According to the official description these are “Four artists representing lost lovers in Purgatory”. Any reader of Dante will know that the “Underworld” and “Purgatory” are not the same thing, and if they are being punished for eternity what are they so sprightly and wearing all white? In itself it is a wonderfully playful act that includes the women walking the wires – one in pointe shoes and one in high heels. One gets the feeling that Paulus did not want to exclude the act but also didn’t know where to place it in the line-up. This time Cali kidnaps Romeo and Miranda goes to save him, arriving at Cali’s lair through a trap-door, thus traveling up again when down would have been the more likely direction. To help her save Romeo, Miranda calls on the Valkyries who swoop in on aerial straps and Miranda banishes Cali and the newly evil Peacock Goddess with the crystal orb given her by the Moon Goddess in Act 1. With this, Paulus leaves the mature reconciliation with the dark forces in The Tempest behind. There is no equivalent to Prospero saying of Caliban, “this thing of darkness I / Acknowledge mine.” Rather, she has turned entirely toward The Magic Flute, which she directed for the COC last year, where the power of light simply vanquishes the power darkness, represented by the Queen of the Night and her cohorts. Of course, in Flute it’s the sun and its constancy that conquers darkness rather than, incongruously, the variable moon as here. If the story itself is problematic so is the way it is told. The most obvious flaw is that the clowns are even more annoying than usual in Cirque shows. The show begins with Deeda making all the usual announcements and warnings about watching live theatre. She speaks primarily in French and we think she will be quite a clever, likeable character. Unfortunately, once Jeeves arrives, she becomes a monosyllabic idiot with “Si” and “No” as her entire vocabulary. As Jeeves, Nathalie Claude does not have a clue how to make even the most archetypal clown situations amusing, such as finding a fish in her trousers. When Deeda’s babies arrive (the clowns clearly live on a different time scale from the main characters) they are shaped like footballs. The notion of tossing babies back and forth and dropping or kicking them, no matter what their shape, is just not funny and I hope children don’t imitate any of these stunts with their infant siblings at home. Second, Paulus’s start-and-stop pacing makes the show seem much longer than it is. The show begins quietly and simply with Prospera guiding a long silken cloth to dance and take on multiple shapes in mid air. This grows into a general celebration for Miranda that introduces artists of all the acts, except the shipwrecked crew, the Amazons and the Goddesses. The celebration continues with a fast-paced unicycle duo (Satomi and Yuka Sakaino) who arrive in bamboo hoop-skirts that they soon discard. This segues into an act combining Icarian Games (people juggling people with their feet) while those being juggled manipulate water-meteors (long ropes kept spinning with a globe at each end). This climaxes in the storm when the God and Goddess of the Wind (Suren Bozyan and Karyna Konchakivska) perform a beautiful aerial duet while Prospera sits in the crescent-shaped throne of the Moon and plays the cello. The problem is that flying Prospera at the same level as the aerialists creates a constant visual distraction from their performance. After the abandoned crew is discovered and a painful clown scene ensues, Romeo wanders off in search of the young woman he glimpsed. The forest he traverses is represented by both standing and hanging hooked poles with various creatures on them. One thinks this will develop into an acrobatic act, but it does not. This is followed by Romeo’s glimpse of the dance of the Peacock Goddess (in white) which overstays its minimal welcome. Fortunately this is succeeded by a lovely aerial hoop routine by the Moon Goddess and a display of Miranda’s skills. She is an expert contortionist and hand-balancer who dismounts directly into a huge glass bowl of water where she glides until she takes up her next position. This a beautiful, sensuous scene where Romeo joins her in the bowl and they share their first kiss. This would have been an excellent point to end Act 1, but Paulus chooses instead to finish with a group display of the Amazons on two sets of uneven bars. This is the weakest acrobatic act not only in this show but in any Cirque show I’ve seen. Not only is the routine uninterestingly choreographed, paling with any uneven bar routine you’ve seen at the Olympics, but the team shows little sense of precision which is the whole point in have a group engage in what is otherwise an individual event. The women frequently do not stick their dismounts and when they start to lose balance, roll on the mat and strike a pose as if on purpose. With the exception of Miranda’s routine, the acts before intermission have ranged from goodish to not good at all. Luckily, the acts after intermission are more exciting. The action starts with a typical teeterboard routine featuring the male crew. What makes it enjoyable is the sense of fun and spontaneity the group captures that had been completely lacking in the Amazons’ uneven bars routine. Every member serves as flyers, catchers and pushers. It’s true they did not always stick their dismounts either, but at least they did not try to cover them up. Romeo and Miranda watch the Balance Goddess perform a demonstration of the importance of balance in life and in love. Without a doubt this is the most outstanding act of the entire show, all the more remarkable for its emphasis on quiet concentration than on high-flying movement. One by one Lara Jacobs Rigolo picks up thirteen bamboos stems of increasing size with her foot and places them in her hand. She balances the previous stems on top of each new stem until she has used them all up. For once the audience is dead silent as the tension mounts with each addition. It is truly incredible and certainly unlike any circus act you’ve ever seen before. When she finished her painstaking task she deservedly received the loudest ovation of the evening that was repeated when she took her bow during the finale. acts than have gone before and more like the acts in Quidam, he invests his performance with emotion. His striving to climb the upright pole, his pushing himself into the full “flag” position, his wrapping himself around it, releasing and catching himself just centimetres from the floor are not just circus tricks but become expressions of his desire for Miranda and his frustration with himself and his situation in trying to rescue her. His ability through acting and movement to transmute action into feeling reveals the magical quality that has been missing throughout the show. danger unlike Miranda’s bizarre “imprisonment” by clearly benign tightrope dancers. Up to this point we have assumed that the performer playing Cali is simply an actor and tumbler, excellent at exuding malice with a glance or change of posture. In fact, Cali’s act is juggling and this he demonstrates as increasing numbers of balls drop from above into his hands as he stands on the lid entrapping Romeo. Observant Cirque fans will recognize Viktor Yee’s routine which mixes standard juggling with rolling the balls around his arms and head, as basically the same one he used in Dralion of 1999 with a few notable additions such as including one ball on fire. We have to applaud Cirque du Soleil for allowing Diane Paulus to create a show with a feminist spin. 70% of the cast are women as is 100% of the band. Costume designer Mérédith Caron has wisely decided to go for practicality over sheer extravagance. For the human and divine characters she has subtly mixed aspects of Elizabethan clothing like doublets and slashed breeches, with modern thick-soled boots that accord well with the hard rockin’ music of Bill & Bill. Except for the two coloured peacocks with huge spreadable tales and the marvellous lizard costume for Cali, we often can’t tell what Caron’s costumes for the various animals of the island are meant to represent. Scott Pask’s set uses curved metal rods to suggest the island forest without the clutter of leaves. This clean abstraction helps set off the circus acts better than some of the more elaborate sets Cirque has used. The final image of the show is meant to reflect the beginning – a cloth, this time blue, magically, sinuously floating in mid-air centrestage – except that it fell down from its buffet of air before the scene was over. This tended to sum up the problem with the entire show. Despite having played for three months in Montreal before arriving here, the show on opening night was beset with more errors than I’ve ever seen in a Cirque show before. Only the work of Mykhailova, Doye and Rigolo truly impressed. Otherwise, the acts seems seemed standard but not exceptional, and many with botched dismounts or dropped objects lacked the precision we have come to expect from the company. Has Cirque du Soleil expanded so much, now with twenty resident or touring shows on the go, that it has begun to use up all the topmost circus talent in the world and has had to start employing the ranks of lesser acts? With its more than 1200 artists from 40 countries, has it begun to exhaust the highest echelon of talent available? These kinds of questions arose when a show with so much potential failed to reach the perfect blending of circus and narrative that so many other Cirque du Soleil shows have achieved. Photo: (top) Iulia Mykhailova and Édouard Doye; (upper middle) Lara Jacobs Rigolo; (middle) Édouard Doye; (lower middle) Viktor Kee. ©2012 Laurence Labat.